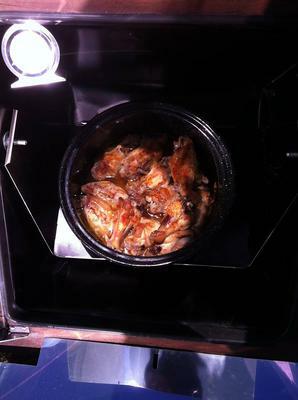 Basic Solar Chicken Wings - Easy! Solar cooking, like any cooking method, takes a little practice. I used a Global Sun Oven in Boston, at latitude 42, to cook this dish - the photos were taken mid-September. The clear autumn day provided lots of solar cooking power for the GSO. This is a no-frills recipe. It's perfect for on-the-road solar cooking: tailgating at local football games, or on hotel balconies at travel hockey tournaments! Pack the perishable ingredients in a cooler, portion out spices into a small zipper storage bag or small jar (even an empty plastic breath mint container will work). 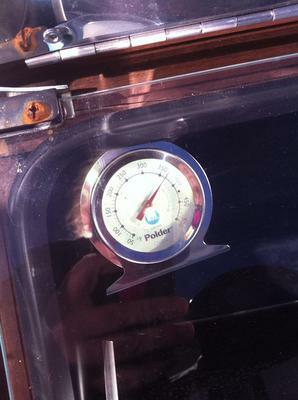 The GSO comes with the built-in thermometer as shown. This measures oven chamber cooking temperature. I still have to confirm meat temperatures directly with a separate probe thermometer. Roasted foods are best cooked with a cover to minimize condensation on the oven glass. Here I used a black 3L Granite Ware roaster with a lid. The thin metal of the pan absorbs and transmits heat quickly. If you anticipate significant temperature fluctuations (lots of dense clouds moving through intermittently), a heavier metal/stoneware dish will retain heat longer and maintain a steadier temperature in poor cooking conditions. *Your favorite seasonings! If you love the smoky taste of grill-roasted food, try using smoked spices. I used a simple mix of sea salt, black pepper, smoked paprika and ground chipotle and cayenne pepper in this batch. Place wings in a single layer in roasting pan. (If you prefer, you can place a trivet/rack in the pan and place the wings on the rack, to keep them above the pan drippings. Spray the rack with non-stick cooking spray for easier cleanup!) Sprinkle all wings lightly with your favorite seasonings. Dot wings with butter, as shown in photo. Roast wings, covered, at 375F for about 45 minutes, or until juices run clear. Chicken is considered safe to eat when the internal temperature reaches 165F. 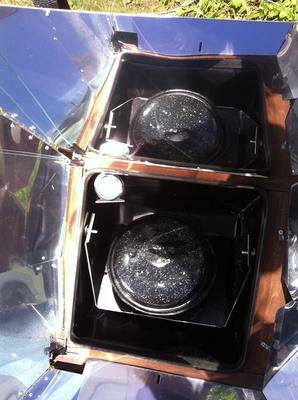 Solar cooking times can vary widely, due to haze, clouds, accuracy of oven focus, etc. Rely on your observations more than the timer! The pan juices can be saved to make gravy or stock later. 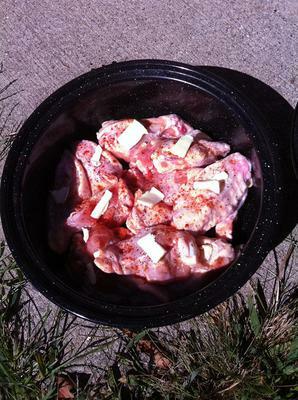 This aught to be a favorite solar cooker recipe for the guys, and it's even football season right now.